North Korean leader Kim Jong-un has been photographed visiting a cosmetics factory in the country’s capital Pyongyang. 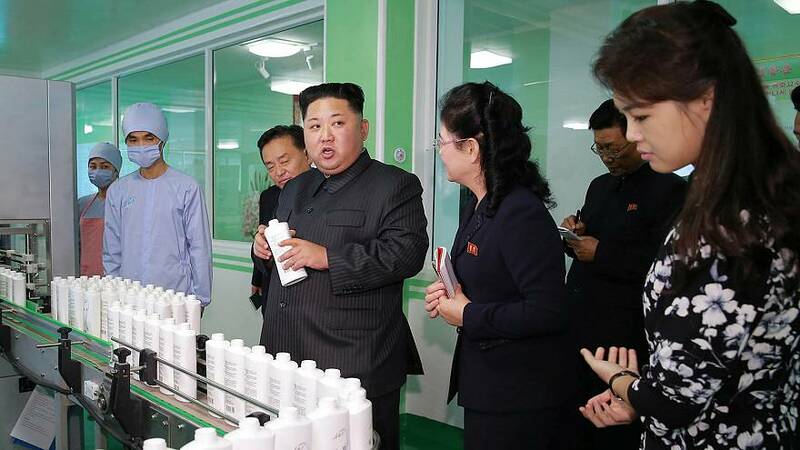 While the world has grown accustomed to seeing Kim in the company of generals inspecting military installations and missile sites, images released by state media show the leader’s focus very much on moisturisers and make-up. Kim was accompanied on the tour by the country’s two most powerful women, his rarely-seen wife Ri Sol-ju who is in the pictures, and, off-camera, his sister Kim Yo-jong. Miss Kim was recently promoted to a leading role in the ruling party’s politburo by her brother. It is believed that she is also responsible for maintaining the leader’s public image, which may explain the photo op in a setting choreographed to show a more genteel side to her sibling. The import of luxury goods to North Korea has dried up in recent years as UN sanctions bite. Kim’s visit can be seen as something of a propaganda effort by the regime, signalling to its people that it can provide them with high-end luxury items despite punitive sanctions. According to the North Korean state news agency, Kim praised the factory for producing “world-level cosmetics” that would help the country’s women “to be beautiful”. He went on to describe the packaging as being “very nice”. Tensions remain high in the region following a series of North Korean missile tests and ratcheting rhetoric between Kim and US President Donald Trump.